If I'd been competing I probably would have gone for something more elaborate. Probably. 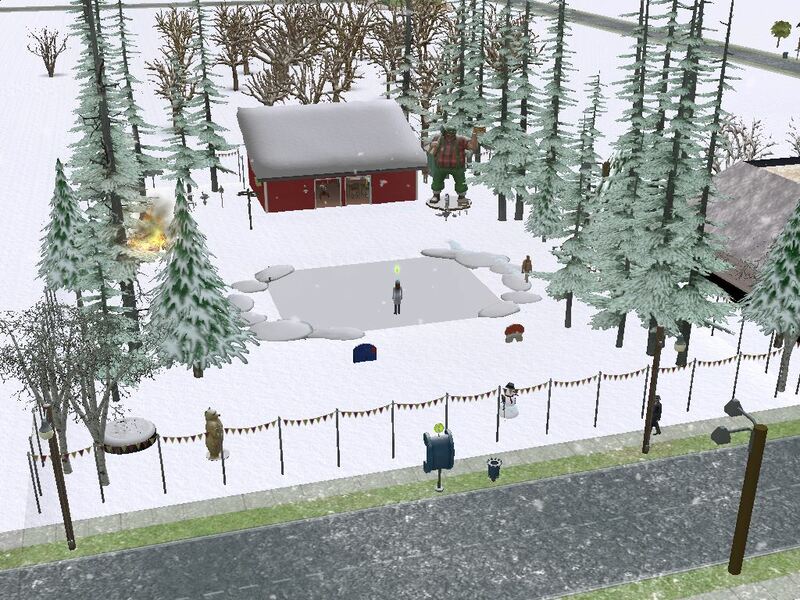 But if there's one thing Three Lakes needs and doesn't have, it's an ice rink; and if you put anything else on the lot, the sims won't skate. So here we have a simple, outdoor rink with a shed to warm up in, a composting outhouse you won't want to use unless it's an emergency, and birdfeeders so the life birds will come to the birders rather than them having to go hiking through the snowy woods getting lost and freezing. Someday, I will take a good front view. Today was not that day. Goal for the next phase: Make a lot look interesting from behind. Details are a little snowy since pics were taken after playtesting in full winter mode. That round thing in the lower left is a tractor tire planter. Floorplan of shed. Everything you need to warm up - stove, hot chocolate, coffee, and carbohydrate-rich comfort food! The skiier dangling over the hot chocolate counter is a controller that guarantees a snowy lot in live mode. It's kind of a hard lot to take show-off pictures of, but here you go anyhow. Welcome to the coldest fun you'll ever have! The bear greets you with some skepticism. He doesn't believe you can skate worth a darn. Note the speaker on the shed, for slapdancing to keep warm as well as to provide background for romantic couples skating. Or how about a snowball fight? The jolly lumberjack welcomes you, and keeps the outhouse from being too obvious. Now it's time to go into the shed to get warm. The barista is a native and likes to show off her cold-hardiness. She's also responsible for stoking the stove, keeping the lot tidy, and maintaining the bulletin board. She just tore a lot of outdated notices off of it. Wash your hands in the bucket and tuck into some flapjacks! May the contest curse relent and everyone who's actually competing get their lots in on time. Good luck. Just Petro, do you have any hot chocolate back there? With marshmallows or without, I'm not picky as long as it's almost hot enough to burn my mouth.